The Eurozone, the group of European Union (EU) members that have adopted the Euro, has struggled to recover from the debt crises it faced following the Great Recession in the United States. While the risk of collapse has been neutralized, Eurozone countries face a longer road to recovery than the United Kingdom and the United States. The Eurozone’s economy, the world’s second largest at $13.2 trillion, suffers from the dual problems of high unemployment rates and low growth in GDP. The European Central Bank (ECB) President, Mario Draghi, wants to respond with a measure used by Japan, the United Kingdom, and the United States called quantitative easing. Eurozone opinions clash over this approach, though—some nations agree with Mr. Draghi and want to implement the measure to remedy the sluggish economic recovery. Naturally, Germany does not. Germany sits comfortably atop the Eurozone in terms of low inflation and unemployment rates, but their lack of GDP growth causes concern. Given that this weakness plagues even the Eurozone’s strongest economy, it would seem that Germany, too, would support an ECB stimulus measure involving quantitative easing. However, as this argues, the stimulus measure would be significantly different from similar programs employed successfully by the United States and the United Kingdom. The specific authority granted to the ECB creates this distinction. Additionally, the individual strength of the Eurozone’s heaviest hitter will have particular impact due to the EU’s and ECB’s framework. The legal structure of the ECB and the EU creates a particularly difficult climate for implementing quantitative easing and sets up an arena for Germany to call the shots. The European Union is founded on principles of conferral by its member states and operates within by representative democracy to meet its objectives, including economic cohesion, by the creation of a monetary union under a single European currency. This objective is carried out through an institutional framework that creates several bodies of power, including the European Central Bank. Jurisdiction to control monetary policy rests with the ECB. The ECB is controlled by the Governing Council, which consists of the elected Executive Board and the governors of the national central bank of each Eurozone member state. Currently, each member of the Governing Council has one voting right with no rotation system. This setup is ripe for change. Because of the size of the Governing Council, each member of the Executive Board will retain permanent voting rights while the governors will enter into a two group rotation system separated by size of contributed capital to the ECB. The five largest contributing member state’s governors will vote in groups of four, with one governor sitting out each month, and the remaining fourteen governors will vote in groups of eleven, with three governors sitting out each month. Each Eurozone member state’s population and GDP determine their capital contribution to the ECB. The net income from monetary policy operations within the European System of Central Banks is first allocated to a reserve fund held by the ECB and then dispersed to member states’ central banks in proportion to contributed capital. Consequently, any losses are first counted against the reserve fund and then proportionally against the member states’ central banks. Among the ECB’s powers is the ability to enter into open market operations, an activity that is necessary for quantitative easing. However, the funding of public debt or the sovereign debt of any of the member states, including any institution of the European Union, is expressly forbidden. This means that the ECB cannot go into the market and purchase bonds issued by any of the member states or the European Union. The United States central banking system is divided into twelve Reserve Bank Districts in which nationally chartered banks subscribe in capital to the respective Federal Reserve Bank. Each Reserve Bank carries out the monetary policy of the United States, not unlike the national central banks of Eurozone member states. Additionally, each Federal Reserve Bank is assigned voting rights in the Federal Open Market Committee (FOMC), which regulates the open market operations of the Federal Reserve System. The FOMC is able to affect changes in monetary policy through voting rights divided amongst the Federal Reserve Banks and the Board of Governors of the Federal Reserve System, which is composed of seven members appointed by the President and confirmed by the Senate. These seven members operate as the central unit of the Federal Reserve System. The Board of Governors and the Federal Reserve Bank of New York retain permanent voting rights; the Federal Reserve Banks of Chicago and Cleveland each vote every other year; and the remaining banks are divided into groups of three with each bank in a single group voting every third year. Where the Board of Governors holds a permanent seven to five majority in the FOMC, the ECB Executive Board holds only six votes against an eleven-vote majority in the Governing Council. The ECB’s ability to enter into open market operations, like that of the Federal Reserve System, gives it a powerful tool to affect monetary policy through the purchase of assets and securities. However, the greatest difference is the ECB’s inability to buy the public debt of any member state or institution of the European Union. Across the pond, each Federal Reserve Bank is explicitly allowed to buy the public debt of American states or foreign nations, or any debt or obligation of the U.S. federal government in the open market within certain limitations. This grant of power is necessary for quantitative easing in the United States, and is missing in the ECB Governing Council. In the wake of the 2008 recession, the United States, the United Kingdom, and Japan conducted quantitative easing in order to combat economic pressures. While the U.S. and the U.K. have seen returns on their stimulus plans, Japan has struggled, but it still shows great confidence in quantitative easing as it prepares for another round of easing at an unprecedented level. Such implementations by top central banks have experts questioning the ECB’s lack of action in this area. Mario Draghi, president of the Executive Board of the ECB, has announced his willingness to adopt quantitative easing as the next step in a long fight for recovery. The Executive Board seems to also be in support, as Vitor Constancio, the ECB Vice President, echoed Draghi’s announcement and suggested that, beginning in January 2015, the ECB would engage in quantitative easing and purchase sovereign debt, including French, German, and Italian government bonds. However, some members of the Governing Board have expressed an unwillingness to vote for a quantitative easing plan. The German representation on the Governing Board has asserted extreme opposition to the adoption of a quantitative easing plan and other extreme monetary policy measures. Bundesbank President Jens Weidmann favors structural reform through strict regulation of monetary policy initiatives. Weidmann’s opposition reflects both the fear that printing Euros will lead to wasted spending and the belief that adherence to bank regulation and budgetary austerity are key to rekindling Europe’s economy. The fight over whether or not to implement a quantitative easing program through the ECB may be premature. The ability of the ECB to conduct open market operations is expressly granted, but, unlike the Federal Reserve, the ability to buy public debt of member states is explicitly prohibited. Thus, quantitative easing may be impossible without help from the European Council and Commission. Ireland’s finance minister, Michael Noonan, noticed this fatal flaw, but still called for quantitative easing from the ECB. With Noonan’s position, the readiness of Draghi and Constancio, and Weidmann’s apparent silence on this issue, it would seem that the ECB may have already sought the approval of European Union, implicitly or behind closed doors, or will find a way around the statutory language. Indeed, a preliminary opinion from the European Court of Justice contingently approved of some form of Draghi’s quantitative easing plan, holding that while the plan is “unconventional,” the ECB’s broad discretion to take action must be upheld. The fight for monetary policy action in Europe ripens as success from and confidence in quantitative easing by major central banks around the world grows. However, the German juggernaut stands firm in opposition to the proposed methods. 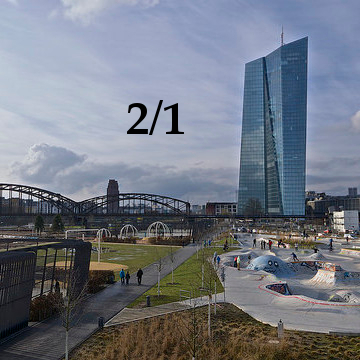 The law of the European Central Bank favors the German view on two fronts: first, in terms of power to make the decision, and second, with respect to the legal standing to implement it. Those in favor of quantitative easing within the Eurozone will have an uphill battle should they bring it to the vote of the Governing Board, and it remains to be seen how Europe will deal with continued economic pressures should those opposed win the day. Citation: William Morici, Remedying the Recession in the Eurozone: Budgetary Austerity v. Quantitative Easing, 2 Cornell Int’l L.J. Online 166 (2014). Paul Hannon, Irish Finance Minister Urges ECB to Launch Quantitative Easing Program, Wall St. J. (Nov. 28, 2014), http://online.wsj.com/articles/irish­finance­minister­urges­ecb­to­launch­quantitative­easing­program­1417187286. Brian Blackstone, Eurozone Inflation Weakens Again, Adding Pressure on ECB, Wall St. J. (Nov. 28, 2014), http://online.wsj.com/articles/german­retail­sales­pick­up­1417159566. The current unemployment rate remained the same at 11.5 percent through October 2014. Id. Alan S. Blinder, Enough With European Austerity, Bring on the Stimulus, Wall St. J. (Oct. 29, 2014), http://online.wsj.com/articles/alan-s-blinder-enough-with-european-austerity-bring-on-the-stimulus-1414621251. Monetary Policy After the Crash: Controlling Interest, The Economist (Sep. 21, 2013), http://www.economist.com/news/schools-brief/21586527-third-our-series-articles-financial-crisis-looks-unconventional. Id. ; Polyana da Costa, Financial Crisis Timeline: Collapse and Bailout, Bankrate (Mar. 17, 2014), http://www.bankrate.com/finance/federal-reserve/financial-crisis-timeline.aspx. Quantitative easing involves a government printing money to repurchase its own debt securities on the open market to decrease long-term interest rates and to increase the supply on money available for private borrowing and investing. See The Economist, supra note 5. For a more in-depth analysis of quantitative easing, see Michael Joyce et al., Quantitative Easing and Unconventional Monetary Policy—an Introduction, 122 Econ. J. F271 (Oct. 29, 2012), available at http://personal.lse.ac.uk/vayanos/Papers/QEUMCI_EJ12.pdf. Brian Blackstone, Bundesbank’s Weidmann Criticizes ECB’s Stimulus Measures, Wall St. J. (Oct. 7, 2014), http://online.wsj.com/articles/bundesbanks-weidmann-criticizes-ecbs-stimulus-measures-1412693836. Blackstone, supra note 2; Blinder, supra note 4. Consolidated Version of the Treaty on European Union art. 5 § 2, Oct. 26, 2012, 2012 O.J. (C 326) 13, 18 [hereinafter TEU], available at http://eur-lex.europa.eu/legal-content/EN/TXT/?uri=uriserv:OJ.C_.2012.326.01.0001.01.ENG#C_2012326EN.01001301. TEU art. 3 § 6; TEU art. 10 § 1. TEU art. 3 §§ 3–4, 6. TEU art. 13 § 1. Protocol (No. 4) on the Statute of the European System of Central Banks of the European Central Bank, Annex, arts. 1–3, 2012 O.J. (C 326) 230, [Hereinafter ECB Statute]; Consolidated Version of the Treaty on the Functioning of the European Union art. 282 § 1–3, Oct. 26, 2012, 2012 O.J. (C 326) 47, 167 [hereinafter TFEU]. See also TFEU art. 128 § 1 (codifying the ECB’s exclusive right to issue euro banknotes). The ECB Executive Council is made up of a President, Vice President, and four other members each elected by the European Council. ECB Statute arts. § 10–11. ECB Statute art. § 10.2. See The Economist, supra note 5. ECB Statute art. § 21. 12 U.S.C § 222 (2013). The Board of Governors of the Federal Reserve System is much akin to the Executive Board of the ECB. Id. at §§241, 248 (enumerating broad powers of control of the Federal Reserve System and the banks therein), 250 (statutorily granting independence from all other bodies of the United States government). 12 U.S.C § 355 (2013). Brian Blackstone & Todd Buell, Draghi Says ECB Ready to Expand Stimulus Programs, Wall St. J. (Nov. 21, 2014), http://online.wsj.com/articles/draghi­says­ecb­ready­to­expand­asset­purchase­programs­1416559768. Id. ; Hannon, supra note 1; Bank of England, The Distributional Effects of Asset Purchases, paras. 11–12, 50, (July 12, 2012), available at http://www.bankofengland.co.uk/publications/Documents/news/2012/nr073.pdf. Jacob M. Schlesinger, Eleanor Warnock & Takashi Nakamichi, Bank of Japan Announces Massive Stimulus Move, Wall St. J. (Oct. 31, 2014), http://online.wsj.com/articles/bank­of­japan­announces­massive­stimulus­move­1414773082. William Horobin, Eurozone Stagnation Poses Major Risk to Global Growth, OECD Warns, Wall St. J. (Nov. 25, 2014), http://online.wsj.com/articles/eurozone­stagnation­poses­major­risk­to­global­growth­oecd­warns­1416911402; Blinder, supra note 4; Hannon, supra note 1; Blackstone & Buell, supra note 33. Blackstone & Buell, supra note 33. Brian Blackstone & Todd Buell, ECB Prepared to Buy Sovereign Bonds Early Next Year, Says Constancio, Wall St. J. (Nov. 26, 2014), http://online.wsj.com/articles/ecb­prepared­to­buy­sovereign­bonds­early­next­year­says­constancio­1416993947. Blackstone & Buell, supra note 33 (describing the Dutch central bank as being “skeptical” that the quantitative easing plan proposed will be effective); Horobin, supra note 36 (noting that the Austrian central bank cautioned that an analysis of current stimulus efforts is necessary before additional measures are adopted). Andrea Thomas, Bundesbank’s Weidmann Rejects Calls for German Stimulus Plan, Wall St. J. (Nov. 28, 2014), http://online.wsj.com/articles/bundesbanks­weidmann­rejects­calls­for­german­stimulus­plan­1417177202. Blackstone & Buell, supra note 33; Blinder, supra note 4. Comparing The European Central Bank to The U.S. Federal Reserve System supra. 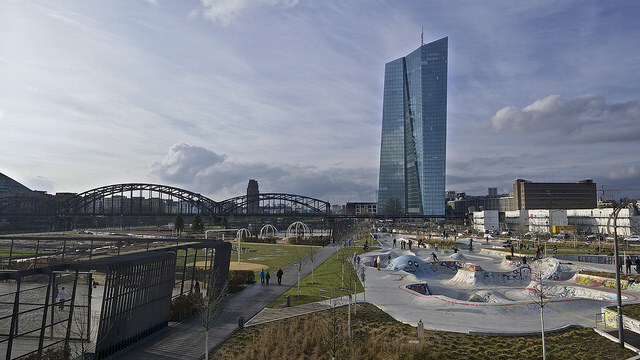 Capital Subscription, The European Central Bank (Jan. 1, 2014), https://www.ecb.europa.eu/ecb/orga/capital/html/index.en.html (noting Deutsche Bundesbank holds about 18% of the shares in the ECB with € 1.94 billion in fully paid capital); Power and Legal Framework supra. See Stephen Fidler, In Brussels, Germany Seen Calling the Shots, Wall St. J. (Nov. 27, 2014), http://online.wsj.com/articles/in­brussels­germany­is­seen­calling­the­shots­1417125897; Blinder, supra note 4. Power and Legal Framework supra. Blackstone & Buell, supra note 33; Blackstone & Buell, supra note 38. Case C‑62/14, Gauweiler v. Deutscher Bundestag, 2015, http://curia.europa.eu/juris/document/document.jsf?text=&docid=161370&pageIndex=0&doclang=en&mode=req&dir=&occ=first&part=1&cid=89820; see also Press Release, Court of Justice of the European Union, According to Advocate General Cruz Villalón, the ECB’s Outright Monetary Transactions Programme is Compatible, In Principle, With the TFEU (Jan. 14, 2015), available at http://curia.europa.eu/jcms/upload/docs/application/pdf/2015-01/cp150002en.pdf.